Kara Long, the Egyptian Theatre’s executive director, displays the frayed rope that sent a vintage backdrop plummeting to the stage. COOS BAY – The terrace fell on a Wednesday in August. Paul Quarino knows it was a Wednesday, because the Egyptian Theatre had been open for Farmers Market. A visiting couple asked to see the Wurlitzer organ, and Quarino, the theater’s organist, took the pair backstage for a personal tour. Eager to display the Egyptian’s historic charms, he began lowering part of a hand-painted backdrop – one depicting a Mediterranean terrace and forest scene. That was when a decades-old hemp rope snapped. Quarino insists the next few moments were not dramatic, though they sound dramatic enough. When the rope gave way, so did a wooden support known as a batten. The heavy canvas mural, now hanging by a single rope, “slithered” to the floor. 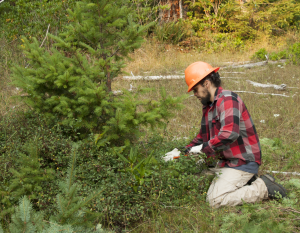 No one was hurt, but the ancient hemp could be trusted no longer. The Egyptian’s famed backdrops would be out of commission until further notice. A year and a half later, Quarino and other members of the Egyptian’s board are looking forward to putting those historic scenes in the public eye once again. 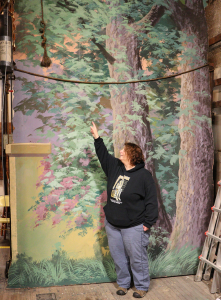 A $5,000 grant from the Coquille Tribal Community Fund provides key funding for a project to rejuvenate the theater’s overhead rigging. Most of the Egyptian’s backdrops date to 1925, when they were painted in Portland and shipped to what was then Marshfield. Along with the terrace scene, they show a Nile River scene, a temple and a forest. A fifth backdrop, depicting Mount Hood, is newer. Kara Long, the theater’s executive director, calls the canvases iconic. No one was hurt when a broken rope released this canvas backdrop. 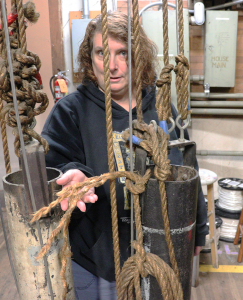 Long expects volunteers will need about three months to replace the theater’s elderly rigging. Restoring the backdrops to working order means replacing the old hemp ropes with durable nylon. 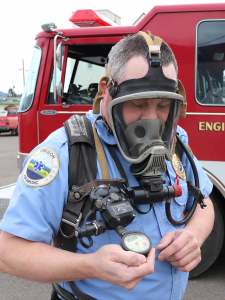 Safety-rated materials will replace some dubious hardware. Steel cables of unknown vintage will make their exit as well. The labor will be donated. An Egyptian board member, formally trained in technical theater, will lead a gang of volunteers. Long estimates the job will take three months. The Tribe is awarding a total of 57 grants for 2018 in six categories: arts and culture, education, environment, historic preservation, health, and public safety. 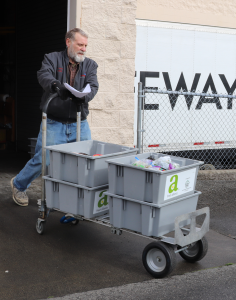 This year’s $291,000 in grants raises the fund’s total to more than $6.1 million since 2001, all supported by revenue from The Mill Casino. Once the backdrops are in place, Long and her board have a busy agenda of additional improvements. They plan to level the sagging stage and rewire the sound system. They also want to relocate the mechanical controls to an overhead platform, freeing the stage’s “wings” for performers to come and go safely. Fundraising for restoration is ongoing. Coos Bay’s Egyptian Theater Preservation Association is always looking for grants, private donations and volunteers. Contact Executive Director Kara Long at kara@egyptian-theatre.com. Local bus service in Coos County will be faster and more convenient thanks to a federal grant obtained by the Coquille Indian Tribe and Coos County Area Transit. By improving bus access to education services, health care, public agencies and job sites, the project is expected to double the ridership on CCAT, from the current 25,000 rides per year to 50,000. Riders will reach their destinations in half the time they spend now. The $200,000 grant comes from the government’s Tribal Transit Program, but Meade emphasized that CCAT’s improved service will benefit the whole community. 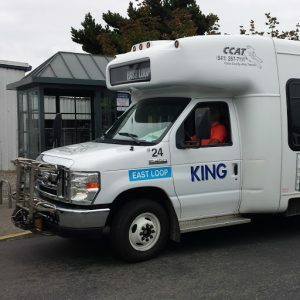 The grant lets CCAT reorganize its two Connector Routes by providing more frequent service and more convenient transfers from one bus to another. That’s made possible by the addition of an Intercity Route linking the Connector Routes. 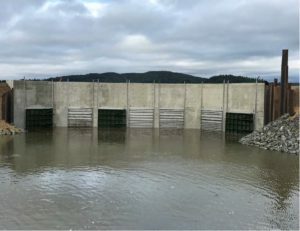 The existing West Connector Route travels from Charleston to Coos Bay, then to Pony Village Mall and the Department of Human Services office on Newmark Avenue. The existing East Connector goes from Eastside to Pony Village. The two routes currently meet at Pony Village and at Walmart. This duplication of stops lengthens both routes. As a result, the wait between buses at each stop is about an hour and 45 minutes. With the Connector Routes no longer duplicating stops, buses will be able to serve each stop every 55 minutes. That’s twice as frequent as the current schedule. 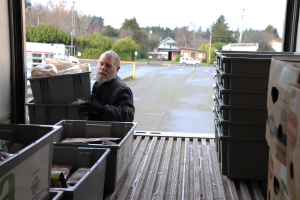 The increased service will add convenience not only for local riders, but also for passengers transferring from buses serving Myrtle Point, Coquille, Bandon and Brookings. The starting date for the expanded service has not yet been determined. Students from nine area high schools and alternative schooling programs attended the Coquille Indian Tribe’s second annual College and Career Fair on Oct. 19. The event was a visible expression of the Tribe’s potlatch tradition. 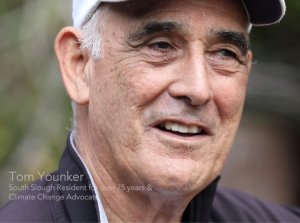 Tribal member Tom Younker is featured in this multimedia research project by University of Oregon students. 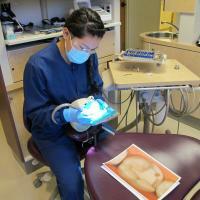 Dental health aide therapists are trained to cover 50 procedures that a full dentist can do, helping poorly served native communities increase access. But, according to The Lund Report, the dental system in general is plagued by an approach that triages the symptoms of disease rather than preventing and eradicating tooth infections. For sustenance, industry or sport, salmon have had a profound influence on people and cultures. The impact of this powerful migratory fish can be seen in art works from prehistoric stone carvings through contemporary glass. 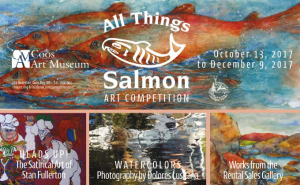 In a nationwide competition/exhibition, the Coos Art Museum focuses on the theme of salmon in contemporary art. This exhibition is funded in part by a grant from the Coquille Tribal Community Fund.